IMAGINE PEACE TOWER in Viðey Island will be illuminated for the 12th time in a beautiful ceremony on Thuesday October 9th at 8 pm. The programme starts at 5:45 pm and lasts until 9:00 pm. On Culture Night the whole of downtown Reykjavík becomes one big pedestrian area. It will be closed to vehicles from 07.00 until 02.00. This arrangement aims to ensure safety. Reykjavik Culture Night will be held on August 18th 2018 from 1-11pm, ending with a magnificent firework show! With Travable, disabled travelers can find restaurants, pools and other attraction based on their accessibility. The information is gathered via users' submission and ratings. ImpovIceland - now in English! Improv Ísland has become hugely popular in recent years. Finally, their shows are available in English! At National Icelandic Horse competition you will have an opportunity to meet up close with the Icelandic horse and see some of the most beautiful creatures in the country. The World Cup's Kick-off is tomorrow, June 14th. This year Icelanders are incredibly excited since our national team qualified for the first time in history - the world's smallest nation to do so! Hafnarfjörður has dubbed itself as the town of Vikings. It's home to Fjörukráin, Reykjavík's only Viking-themed tavern. Here you're also able to attend the annual Viking Festival! This weekend The Reykjavík Maritime Museum will re-open after renovation. On a display are two new exhibitions: "Fish & people" and "Melckmeyt 1659". Entrance this weekend is free. The artwork on show reflects Icelandic nature as interpreted by different artists, with different styles, from various periods. It's common with most visitors wanting to mix in with the locals. Reykjavík's swimming pools have served this purpose well, but in the neighborhoods outside of the city's center, some great cafés and restaurants are to be found that are mainly frequented by locals. The Festival of the Sea will be held 2nd-3rd of June. It's no secret the Reykjavík has ranked high on the World's priciest cities index in recent years. That doesn't mean you can't enjoy the city's charm and culture on a budget. Here are some suggestions on how to make your awesome stay budget friendly. The City's oldest house has become a part of Reykjavík City Museum. With two exhibitions on display, the museum is dedicated to Reykjavík in the 18th and early 19th century. Last week the online travel service Travel Bird released the Green Cities Index of 2018. On top of the list, Iceland's capital can be found, with 411 square meters of green space per person. Whatever questions you have, and how basic, complicated or strange they may seem, we'll happily answer them. Do you know about the "ísbíltúr"? Icelanders LOVE ice cream. And we have a very specific word for ice cream related activity. What to know more? The days from 28th of March to 1st of May in Reykjavík are dedicated to the Icelandic horse. You can experience this true force of nature in the city's center, as well as in natural surroundings. Want to take a peek inside an Icelandic home? Reykjavík City Card not only gives you free access to some awesome stuff, but also comes with added value in the form of discounts at our partners. Easter is a National holiday in Iceland. Many visitors embark on the journey known as the "Golden Circle". A visit to the "Secret Lagoon" accompanies it very well. The 6th annual instalment of Sónar Reykjavík will take place on 16th-17th of March. Like before, the focus is on the world of electronica, hip-hop and other modern music. Although the official opening is on Thursday, some of the events will take a head start and open as early as Tuesday. Many visitors ponder over the number of cats roaming the streets of Reykjavík. These furry friends often behave like they own the place, taking no notice of passing people or cars. Most of them are well-behaved and friendly, though some you might consider a bit arrogant. If you're a foodie, you're lucky to be in Reykjavík this weekend. The annual gourmet feast, Food & Fun is on from 28th February to 4th of March. 21 chefs from 14 countries partake this year. On this weekend is the annual Reykjavík Folk Festival. This is the 8th time the festival is held, and like the years before the venue is Kex Hostel. Reykjavík was a proud host of European Cities Marketing’s annual spring meeting in 2018. Mount Esja is Reykjavík's best-known mountain. You might imagine that she (yes, in Icelandic we talk about "her") is located somewhere in the wilderness. However, located only a 30-minute drive from central Reykjavík, she is a popular hiking spot the year around for locals and visitors alike. Snowstorm on Saturday - Here's fun stuff you can do! We're having "stay-inside-weather" on Saturday, and you're wondering what to do? Here's what we suggest: With the Reykjavík City Card, you will have free admission to the city's top museums, free entry for all the swimming pools and unlimited bus-rides. Really, a perfect companion for when stuck inside. A roughly 2-hour drive from central Reykjavík, one of Iceland's best-known landmarks can be found tucked away in a canyon. On January 20th 2018, a new exhibition will open at Reykjavik Museum of Photography. In the exhibition, titled „This Island Earth“, five photographers living in Iceland will turn their gaze toward Icelandic Nature in all its glory. You are welcome to the opening of two shows at the Reykjavík Art Museum - Kjarvalsstaðir on Saturday 13 January, at 4 pm. The exhibition la durée show works by the beloved Icelandic artist, Jóhannes S. Kjarval (1885-1972) and the exhibition Tales of the Unseen is a collection of works by artists who have been inspired by folklore and fantasy. The first concert will be at Grófin Culture House on 12 January at 12.15-13. The concert will be repeated at Gerduberg Culture House on 11 January 11 at 12.15-13 and in the Culture House at Spöngin on 13 January at 13.15-14. Sundhöll Reykjavíkur was reopened few weeks ago after extensive renovations with a new outdoor pool, several new hot tubs and an ice bath. Enjoy Þrettándabrennur bonfires in Reykjavík! The Þrettándinn is a unique Icelandic holiday on the 6 January. It marks the official close of the Christmas season. Literally translated it means "the thirteenth" - same as Twelfth Night in English, but 13th in Icelandic because we start celebrating a day earlier than the Anglo-Saxons. We say farewell to Christmas with bonfires and fireworks and all kinds of strange creatures. New Year’s Bonfires (Áramótabrennur) will be in 18 places in Reykjavík Capital Area this year and in a similar manner and locations as before. There you can join the locals, experience old age customs and traditions of the New Year’s celebration. 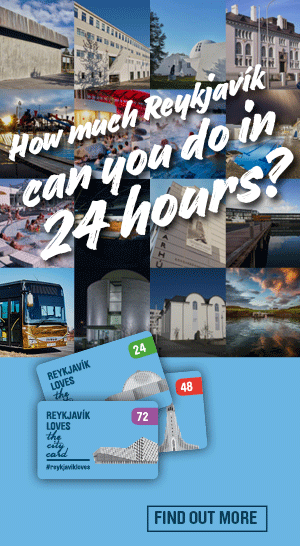 Visit Reykjavík has launched a new webpage about the Reykjavík City Card, citycard.is where you can get all the information you need about where to buy, how to use and what is included in the card. Reykjavík has been named European Adventure Destination of the Year for 2018 by the Luxury Travel Guide (LTG). This is the second consecutive year that the prestigious travel periodical LTG has selected Reykjavík as a destination: In 2017 Reykjavík was LTG Winter Destination of the Year. Reykjavík City is committed in making sustainable and responsible tourism attainable. Quality and the environment are decisive factors, which is mirrored in the Tourism Strategy for the City of Reykjavík. Iceland's first food hall has opened at Hlemmur square in Reykjavík, thanks to a rapid boom in tourism and our fast expanding dining scene. Reykjavík has been chosen as one of the best travel destinations in 2018 by TravelSquire. Sigur Rós announced day-by-day schedule in late October for NORÐUR OG NIÐUR, their ambitious curation of Harpa, Reykjavik’s premiere state-of-the-art venue. This December 27-30, the shortest, darkest days of Iceland’s Winter will play host to a multimedia event bringing together performances from friends and collaborators from all over the world, many of whom are showcasing brand new works! Lighting of the Oslo Christmas Tree 2017! The Advent this year will be formally launched on 3 December at 16:00, with the lighting of the Christmas lights on the Oslo Tree in Austurvöllur. Reykjavík is known for its high-quality restaurants with a selection of both local and international dishes. The International performance festival Everybody´s Spectacular will be in Reykjavík from 15-19 November. Expect exceptional work, vibrant talks, heady parties, and a wide variety of additional formats that bring audiences and artists alike into conversation with contemporary performance. One of Reykjavík's finest music festival, Iceland Airwaves, begins tomorrow and is on until 5 November. Yoko Ono invites all guests of the Illumination of the Imagine Peace Tower to write down their wishes and hang them on one of her wishing trees. Yoko will be paying her annual visit to Iceland this October, to signal the illumination of Imagine Peace Tower in memory of John Lennon on Monday 9th October - his birthday. Admission is free to Gröndal‘s House for the whole month of October. Residents of the greater Reykjavík area continue be generally favourable towards tourists according to an opinion poll carried out this summer for Visit Reykjavík. Icelandic has been spoken in Iceland since the country was settled in the 9th century and has changed little since then. A new arrangement for tourist bus/coach traffic in the capital city centre was approved by the Environment and Planning Committee on 3 May 2017 and by the city council on 11 May. Reykjavík International Literary Festival will take place from 6-9 September for the13th time. Its ambitious event schedule brings 17 internationally acclaimed authors from outside of Iceland together with some of the most well-known Icelandic authors. The biggest festival of Reykjavík, Culture Night will be held for the 22nd time on Saturday 19 August 2017. Útihátíð Festival takes place in SPOT Kópavogur this Saturday and Sunday, 5 - 6 August. This is the 8th time this festival is held! In Reykjavík we also celebrate the Tradesmen's Weekend with a festival called Innipúkinn. The English Premier league is coming to Iceland next Friday 4th of August when two of the world’s greatest football teams, Manchester City and West Ham, face off at Laugardalsvöllur stadium at 2 pm. In July a new restaurant and café were opened on the top floor of Perlan. Perlan is one of the many iconic sights to visit in Reykjavík. Travel Weekly's has chosen Reykjavík as one of the best destinations in the world for city breaks. Reykjavík is in 5th place after New York, Barcelona, Rome and Amsterdam. An official Fanzone for the UEFA European Football Championship 2017 in Holland will open at Ingólfstorg on July 16 and be open to the public throughout the competition. All matches will be shown along with family friendly entertainment. Perlan Museum- Wonders of Iceland is one of the largest and most ambitious exhibition project in Reykjavík in recent years. The first exhibition, Glaciers and Ice, opened on 2 July and more will follow next year. Reykjavík is named the Best MICE Destination in Europe 2017 by Business Destinations Magazine. The Business Destinations Travel Awards, now running for a consecutive six years, rewards businesses in a variety of categories for their exceptional contribution and excellence in services in the world of business and travel. Icelandic service providers have had great success at the awards over the past years. Expedia's travel blog highlights some of the most LGBTQ-friendly cities around the world and among them is Reykjavík. They searched the globe for places where the right to be yourself and considered equal are important aspects of the culture, laws, social scene, and employment structures. For the first time ever the Super Match hits Iceland and it’s also the very first time for Premier League teams to meet in Iceland. In the Super Match, two of the world’s greatest football teams face each other and this summer we’re delighted to bring Manchester City and West Ham to Iceland at Laugardalsvöllur Arena on the 4th of August, kick off 14. Reykjavík City supports the event. 17 June is National Day in Iceland- Let’s celebrate! National Day will be celebrated in style this year in Reykjavík, with events focussing around the Lake and extending into adjacent streets, gardens and parks. The programme includes family entertainment, live music, street theatre, dance, a circus, playgrounds for children, booths selling a range of refreshments, sports performances, a vintage car show…. and much, much more. The 5k Color Run in Reykjavík! This Saturday, The Color Run by Alvogen will take place in downtown Reykjavík, with approximately 12.000 people expected to participate in the fun. Don´t miss the Seaman´s Day celebrations in Reykjavík this weekend. This is a festival which has been held annually throughout Iceland´s coastline towns and villages since 1938. The festival honours all those that work at sea and in fisheries in Iceland. The Viking festival is for the whole family. An amazing group of Vikings traveling from all over the world will come and celebrate with us the 22nd annual Viking Festival. After a successful series of international appearances in recent years, including major survey exhibitions on both sides of the Atlantic, Ragnar Kjartansson opens his first museum show in his homeland, Iceland next Saturday. You´ve probably heard that Reykjavík is a very expensive city to travel to but there are various places to visit and things to do which don´t cost a thing or very little. Norður og Niður - Sigur Rós announce expansive takeover of Iceland’s largest arts venue Harpa Concert Hall Reykjavík December 26th - 31st 2017. A retrospective of the works of Louisa Matthíasdóttir Calm was opened at Reykjavík Art Museum – Kjarvalsstaðir last weekend. The third Spirit of Humanity Forum will take place from the 27-29 April 2017 in Reykjavík, Iceland at Háskólabíó Cinema. This follows two successful Spirit of Humanity (SoH) Forums supported by the City of Reykjavík. Bæjarins bestu hot dog stand in downtown Reykjavík has a reputation of selling the best hot dogs in Iceland and many visitors claim the hot dogs to be some of the best in the world. DesignMarch is Iceland’s most important annual design festival. Organized for the ninth time this year, it will be the largest and most significant yet, with an expected 100 or so events that will transform the most northerly capital in the world into one big venue for design. The Marshall House will open on Saturday 18 March at 2 pm with the exhibition Bad Company. The house is a new center for visual art in Reykjavík, where Kling & Bang, The Living Art Museum and Studio Ólafur Elíasson will reside. Roundabout Baltic is an international design exhibition presenting objects created in eight countries connected by the coastline of the Baltic Sea. Big news for food lovers the world over, there’s one more reason to add Iceland to bucket lists with the announcement that the country’s very first Michelin star has been awarded to Reykjavík restaurant, DILL. Music, creativity and technology will be characteristic for Reykjavík on 16, 17 and 18 February because then the Sónar Reykjavík festival is going on. The 5th edition Sónar Reykjavík takes place at one of Europe's most unique concert venues, Harpa. United Kingdom – 2nd February 2017 - The Luxury Travel Guide Awards team is pleased to announce that Visit Reykjavik has won Winter Destination of the Year – Reykjavik, Iceland in the 2017 LTG European Awards. A splendid Winter Lights Festival will take place 2-5 February in all six municipalities of the capital area. This is the sixteenth time that this festival of light and darkness is held, comprising four main features – Museum Night, Swimming Pool Night, Snow Party and Light Art – along with more than 150 events to which countless artists contribute in order to create a unique ambiance in the Greater Reykjavík area. Bloomberg just posted a great article which can help you plan the perfect Northern Lights trip in Iceland. New Year’s Bonfires (Áramótabrennur) will be in 17 places in the Reykjavík this year and in a similar manner as before. You can join the locals and experience old age customs and traditions of the New Year’s celebration. Are you looking for fun festivities in Reykjavík during the holidays? Do you need information about opening hours of museums, cultural institutions, thermal pools, restaurants, shops, pharmacies or other services? The month of December will offer a packed programme of events in Reykjavík, formally launched on 27 November with the lighting of the Christmas lights on the Oslo tree on Austurvöllur. The event begins at 16:00, and some of the Icelandic Yuletide Lads (jólasveinar) are expected to make an appearance. The Iceland Airwaves festival starts tomorrow, Wednesday 2 November 2016 and is being held for the 18th time! This biggest celebration of music in Iceland boasts an unrivaled line-up of established and up-and-coming artists. As We Grow received the Icelandic Design Award 2016 and Geysir received the award for Best Investment in Design in a ceremony at Culture House in October. Join the Reykjavík Art Museum´s docent for a tour through the exhibitions of Jóhannes Kjarval (1885-1972) and Hildur Bjarnadóttir (b. 1969) every Friday at Kjarvalsstaðir at 2 p.m.
Planning a Northern Lights Trip to Iceland? Thinking about coming to Iceland this winter to check out the Northern Lights? We´ve combined some informative articles that will get you started. Planning your trip ahead of time and reading up on how to photograph the lights is a good start. Three of the recipients of the 2016 Lennon Ono Grant For Peace, announced by Yoko Ono earlier this year, will be travelling to Reykjavik, Iceland to be presented the award on John Lennon’s Birthday - October 9. IMAGINE PEACE TOWER in Viðey Island will be illuminated for the 10th time in a beautiful ceremony on Sunday October 9th at 8 pm. The programme starts at 5:15 pm and lasts until 9:30 pm. The University of Iceland and the City of Reykjavík are launching Höfði Reykjavik Peace Centre on October 7, 2016. The opening seminar entitled Rethinking Peace and Power will take place between 13:00 and 17:30 in the Ceremonial Hall of the University of Iceland, with opening remarks by Guðni Th. Jóhannesson, President of Iceland. The panelists and audience will engage in a dialogue on the enhanced role of cities and citizens in promoting sustainable peace and on the power of the visual narrative in affecting opinion and igniting action in the world today. The 13th Reykjavík International Film Festival starts today. As before, RIFF focusses on introducing brand new films and documentaries from young and upcoming directors, this time with a particular emphasis on world peace. Due to a great aurora forecast for the evening, Reykjavík City will have street lights turned off between 22:00 and 23:00 in selected areas so everyone can enjoy the Northern lights. The exhibition PORTRAITS by Hasselblad Award Winners will be opened on Saturday, September 24 at 15:00 in Reykjavík Museum of Photography. Reykjavík City has put forward a climate policy paper with an action plan where goals are established for a carbon neutral city by 2040. Reykjavík Art Museum is currently working on a project in collaboration with Yoko Ono, an exhibition of Yoko Ono's artwork which opens 7 October. One of the artist's artworks, ARISING, is created with the audience's participation, both before the exhibition as well as while the exhibition is on-going. This weekend on the 2 & 3 of September, the People’s Meeting will be held at the Nordic House. The meeting is a two-day democracy and political festival. Reykjavík is hosting the Nordic Music Days 2016 at the award-winning cultural and social centre Harpa. The festival, founded in 1888, is one of the world’s oldest music festivals and is held annually in one of the capitals of the Nordic countries. If you're in Iceland for the last weekend in August, you should check out Every Body´s Spectacular - Reykjavík International Performance Festival presented by RDF and Lókal. Every Body´s Spectacular is an annual contemporary performance festival that brings bold brilliant artists - from around the world - into conversation with the city of Reykjavík. Yoko Ono has today announced the four recipients of the 2016 Lennon Ono Grant For Peace, the biennial award she inaugurated in 2002. Reykjavík’s 21st annual Culture Night will be held on Saturday 20 August. Events and performances, large and small, will fill the streets and squares of the town centre, alleys, gardens, galleries, shops, cultural institutes and private homes. The Reykjavík food festival will be held tomorrow 13 August 2016 in downtown Reykjavík. The food festival is a celebration of Icelandic cuisine where chefs and barbecue masters will cook food from Icelandic farmers. The Reykjavík Jazz Festival starts today, 10 August at Harpa Concert Hall for the 27th time and is on until 14 August. The annual Jazz Parade which is today is not to be missed. Reykjavík Pride festival started today when the Mayor of Reykjavík, Mr. Dagur B. Eggertsson, began the painting of a rainbow in the stairs in front of Reykjavík Junior College followed by volunteers who will finish the painting. The theme of Reykjavík Pride this year is ‘Our History’ – the history of queer people, which reference to how the past has shaped ourselves and the society. The Reykjavík City Card is the fastest and easiest way to explore our city! In order to enrich your visit further and make the most of your stay in Reykjavík the city offers a special City Card making it so much easier to you to connect with the extraordinary cultural scene and vibrant city life. Mike Keenan, a travel writer for Troy Media, spent three exhilarating days in Reykjavík and wrote about his five favorite spots in the city. Krás Street Food Market opens on Saturday 23 july in Fógetagarður square in Reykjavik and will remain for the next five weekends. This is the fifth time Krás Street Food Markert will be held and as before delicious delicacies can be expected. The Bloomberg show Hello World recently did an exciting cover story on Iceland’s evolving tech world. Yesterday, Sunday 17 July, a "Sip 'N' slide" waterslide was placed in Bankastræti, a part of the main shopping street in downtown Reykjavík. Iceland is the Safest Country to Travel to for the 6th Year Running! With terrorism at an all time high and global unrest threatening to impact destinations across the world, choosing a safe place to visit is a top priority for holidaymakers. Ever wanted to see the dazzling Aurora in Iceland in your lifetime? LG OLED TV makes your dream become a reality this summer! A big welcome home celebration for the Icelandic men´s national football team will be at Arnarhóll tonight. The next historical football game, Iceland vs France will be shown at Arnarhóll on Sunday. The game starts at 7 pm, the programme will start about one hour before. The Icelandic men’s football team meets Austria today at 4 pm in Paris at the UEFA EURO 2016. This is a historical moment for the Icelandic football. A draw would suffice for the team to move on in the championship, but if that goal isn’t accomplished then this will be Iceland’s last game. Check out the summer program at Bíó Paradís, Iceland’s first and only art-house cinema. This year marks the 72nd anniversary of the independence of Iceland. We celebrate this event on our National Day of Iceland 17 June. The Icelandic Independence Day celebrations in Reykjavík 2016 will take place in the city centre from 10 o´clock in the morning until 18. p.m. The atmosphere yesterday was just phenomenal during the football game Iceland- Portugal at the UEFA Fanzone on Ingólfstorg. There was a big crowd of people watching the Icelandic national men's football team in their first game at the 2016 Euro Cup in France scoring 1-1 against Portugal. Secret Solstice music festival was established for the first time in 2014 and immediately became an instant hit and is held now for the third time next weekend, 16 - 19 June 2016. The venue, Laugardalur Valley is the perfect location for such festival, creating a spectacular scene for midnight sun music celebrations. Iceland´s award-winning concert hall Harpa and Reykjavik City proudly present a new concert series, Reykjavik Classics in Eldborg Harpa, summer 2016. An official Fanzone for the UEFA European Football Championship 2016 in France will formally open at Ingólfstorg on June 10 at 6 p.m. and be open to the public throughout the competition. All matches or 45 matches (apart from those played simultaneously in the last round of the group stage) will be shown along with family friendly entertainment. The Color Run – The Happiest 5k on the planet! A colorful Saturday ahead: Close to 12.000 colorful runners will pack the streets of downtown Reykjavik on Saturday in The Color Run by Alvogen. This weekend, the first weekend of June, an annual event of celebrating the Seaman’s Day is held throughout all of Iceland’s coastline towns and villages. The Seaman's Day has been celebrated in Iceland since 1938 to honour those who work at sea and the fishery in Iceland. The KexReið bicycle race kicks off next Saturday 4 June in downtown Reykjavík for the fourth year running. “Berlin - Reykjavík Creative (Cities) Talk” symposium will be held in Harpa, today, Wednesday 25 May at 17:00 - 20:00. Reykjavík is known for having a great variety of clothing stores, whether you´re looking for exclusive fashion, vintage, 2nd hand or trendy clothing you´re sure to find what you´re looking for. Reykjavík Arts Festival 2016 opens with a dance walk downtown on Saturday 21 May at 1 pm. The walk celebrates the diversity of dance in Iceland which is reflected in the many and diverse dance performances in the festival programme. The dance walk is made in collaboration with the Reykjavík Art Museum and the Icelandic dance scene. Though it’s minuscule in comparison to other European capitals, Reykjavík still manages to offer a coffee house on every corner. This is the beginning of an article on the website travelmag.com. Yesterday the worlds largest Viking ship ever built in modern times is ducked in the Old Harbour in Reykjavík by Harpa Music Hall and Conference Centre. The ship left home port in Haugesund in Norway in late April to sail off for a challenging voyage across the North Atlantic Ocean. Extracted from their award-winning Iceland guidebook, Bradt Travel Guides have released a new e-city guide to Reykjavík. Our beautiful little city has so much to offer, we have compiled a list of some unique and intriguing things you can do while visiting Reykjavík. Open-air screenings of matches in the UEFA European Football Championship 2016 in France will be shown this summer at Ingólfstorg, with the appropriate fittings and programme of events. Last February we had a visit from Denham's productions, but this company produces all of Rick Stein's shows. This particular visit was for filming of the new series, Rick Stein's Long Weekends. Visit Reykjavík's marketing team was there to assist and connect the production team with all participants and the result is airing tonight on BBC 2 in the United Kingdom. Our Annual Festival Calendar is Online! There are 74 exciting annual festivals in the city of Reykjavík. With our annual events calendar, you can plan your trip to Iceland around the festivals which arouse your interests. The First Day of Summer (Sumardagurinn fyrsti) is an annual public holiday in Iceland held on the first Thursday after 18 April. The sixth Reykjavík Children’s Culture Festival will begin on Tuesday 19 April at 11 am with a programme of festivities at the Harpa concert hall. The Children’s Culture Festival is one of the biggest festivals held by the City of Reykjavík, with about 150 free events for children and youngsters. Given that Reykjavík is only a three-hour flight from the UK, it does a great job in otherworldliness. This is the beginning of a new article on the web natgeotraveller.co.uk. Richard Purden, a journalist from the Sunday Mail in Scotland, paid us a visit in March resulting in an article about his experience in Iceland. KEX Hostel will host the third annual Sheep shearing competition on Saturday, 9 April. Skilled farmers from all over the country will compete for the Golden Shears, awarded for shearing speed, quality and skills. Iceland is one of the safest countries for solo female travelers according to Globelink International. There are plenty of reasons to visit Iceland, among them are the other-worldly landscapes, geothermal springs, contemporary cuisines, lively nightlife, music festivals, northern lights, unique photo opportunities, and endless summer days. Iceland makes a diverse getaway for people who have been in relationship for more than 10 years according to Huffpost Travel. The Sun Voyager is a striking steel sculpture by Jón Gunnar Árnason, made to resemble a Viking ship but is in fact a dream boat and an ode to the sun. Bowie – The Session by the world famous Gavin Evans will be opened at Esja, new exhibition area at Harpa, Friday 18 March. The British, Berlin based photographer Gavin Evans is renowned for his uncompromising take on portraiture. An article about the Winter Lights Festival in Reykjavík appeared recently in the Herald of Scotland. The author Adam Jacot was a guest of Visit Reykjavik last year. The crew of the documentary The Meaning of Life, directed by Miguel Gonçalves Mendes, will join musician and composer Hilmar Örn Hilmarsson and Portuguese best-selling writer Valter Hugo Mãe for a performance at Kaldalón in Harpa Wednesday 16 March at 20:00. Hallgrímskirkja is named as one of the top 10 places for reflection in an article by the Guardian. We recommend German Film Days which starts at Bíó Paradís today and runs to 20 March 2016. DesignMarch starts today at the Reykjavík Art Museum! The formal opening of DesignMarch will be at the Reykjavík Art Museum today at 17:30. Designers from a wide variety of backgrounds will display their newest wares at the opening. There are over 30 openings in all of Reykjavík on DesignMarch which starts tomorrow, 10 March. DesignMarch is Iceland’s most important annual design festival and is from Thursday to Sunday or from 10-13 March. Organized for the sixth time this year, it will be the largest and most significant yet, with an expected 100 or so events that will transform the most northerly capital in the world into one big venue for design. In an article written by CITI, Reykjavík is listed as one of the top ten cities that are shaping the future of urban living. The article covers cities which have dealt with various issues in unique and innovative ways. With extraordinary culinary talent, a selection of quality Icelandic ingredients and countless adventures to experience Reykjavík, the Food and Fun festival mixes a variety of exciting elements to create the ultimate recipe for fun. The World´s Greatest Bar Gathering Will be Held in Reykjavík! Reykjavik Bar Summit will be held for the second time from 29 February to 3 March 2016 in down town Reykjavík, Iceland. The Annual Icelandic Beer Festival starts today at KEX Hostel at 17:00. It is a four day festival which celebrates 27 years of beer freedom in Iceland. The English Music Publication Loud And Quiet gives Sónar Reykjavík Music Festival, which was held last weekend, a good review in a newly published article. The exhibition at Kjarvalsstaðir Art Museum consists of both paintings and drawings from Jóhannes S. Kjarval´s career (1885–1972). Kjarval has a unique place in Icelandic cultural history, as one of the nation's most beloved artists of all time. The annual Reykjavík Coffee Festival 2016 starts today at the Reykjavík City Hall at 13:00 and continues until18:00 were baristas will compete in brewing espressos and making traditional coffee. The Festival will continue tomorrow from 11:00-17:00. The 4th Sónar Reykjavík starts today at Harpa at 20:00 and follows the success of its three previous festivals. The program consists of 77 performances on 18,19 and 20 February which all takes place at Harpa Music Hall and Conference Centre. THE IMAGINE PEACE TOWER will be lit on Thursday 18 February at 19:00 in celebration of Yoko Ono's birthday and will remain lit until 09:00 February 19. Can the World Sing Together and Help Bring Peace to Planet Earth? The formal opening of Reykjavík Peace Festival was this morning at the Reykjavík City Hall were 200 children sang for world peace. ‘An Equal Difference’ is a book of portraits, stories, and wisdom by Gabrielle Motola. It is the result of two-and-a-half years of researching, speaking with, and photographing over 70 inspiring people living in Icelandic society today. According to BBC, Iceland offers all the cultural perks of a larger city despite being one of Europe´s smallest capital cities. “Marketing Reykjavík as a Destination for Festivals and Events” was the subject of the lecture which Karen María Jónsdóttir presented on February 5th at the Edinburgh Tourism Action Group 2016 Conference. The Winter Lights Festival was formally opened yesterday with the unveiling of the artwork Slettireka (Busybody) by Halldór Eldjárn and Þórður Hans Baldursson. The Harpa façade was turned into a beautiful interactive canvas by participants. A captivating four-day Winter Lights Festival takes place from the 4th to the 7th of February in all four communities of the capital area. This year is the thirteenth time that this festival of darkness and light is held. The programme comprises four main elements: Museum Night, Swimming Pool Night, Snow Party and Winter Lights, with a total of 150 events to choose from. In November, Harpa, Studio Ólafur Elíasson and The City of Reykjavík called for proposals for an artwork utilizing the façade of Harpa Music Hall. The project aims to provide a platform for local and international artists to interact with Harpa in new and exciting ways through the means of digital and interactive arts. Njarðarskjöldurinn (Motivation award) was awarded in a formal award ceremony at the Whales of Iceland on January 21, 2016. The award goes to the shop which has reached the highest sales in the tourist industry in the past year. Reykjavík City has been chosen the number one city to visit in 2016 by Rough Guide. According to Rough Guide, "increasing numbers of tourists are heading to Reykjavík for the city’s arts scene, cool nightlife and the slew of natural wonders that lie right on its doorstep." Saturday 16 January two new photo exhibitions will open at the National Museum of Iceland. The exhibition, „Mood“, opens at the Reykjavík Museum of Photography Saturday January 16 at 15:00 (3 pm). The exhibition includes photos by Friðgeir Helgason taken in Iceland and The United States, which are a part of a documentary currently being worked on by the filmmaker Þorgeir Guðmundsson about Helgason. Three exhibitions will be opened at Reykjavík Art Museum, Hafnarhús on Friday 15 January at 8. p.m. were works by more than dozen artists will be on display. This is the group exhibition Back to the Sandbox, the solo exhibition Envoi by the German artist Monika Grzymala and the exhibition Rate of Return % by Saemundur Thor Helgason. The subjects of the exhibitions range from examining the relationship between art and radical pedagogy to exploring the role of art in the technologically-sophisticated and market-driven world of today. The artist Michael Joaquin Grey (f. 1961) who participates in the exhibition Back to the Sandbox will commit performance at Thingvellir called One Thousand Citrus Trees @ Thingvellir on the opening day at 11.45 a.m. Marking the shortest day of the year, the Imagine Peace Tower will light up the evening sky on winter solstice and the following week, from December 21 - 31. The light of the tower is well received on these dark winter days and it is also a good reminder that the days will be getting longer from now on. Sopranos, Þóra Einarsdóttir, Dísella Lárusdóttir and Sigríður Ósk Kristjánsdóttir will lift the Christmas spirit as they perform from the balcony, located above restaurant Caruso on Austurstræti 23 December at 21:00. The Christmas Street Food Market will be hosted in Fógetagarðurinn on Saturday 19 December and Sunday 20 December, opening from 13:00 until 19:00 on both days. The market will be held inside a heated tent where representatives from various downtown restaurants in Reykjavík will offer delicious delicacies from their menus. In December, the whole family can have fun together in Laugardalur Christmas Valley, where Christmas lights and decorations set the mood for a festive Advent. Immerse yourself in the sights, smells and sounds of a traditional Icelandic Christmas at Árbær Open Air Museum. The ever popular Christmas program at Árbær Open Air Museum has become a fixture of the Reykjavík Christmas calendar. The annual Christmas Calendar at the Nordic House is an daily event from 1.-23. December at 12.34. We are expecting a Hurricane force storm hitting all Iceland today, Monday 7 December and into the morning of Tuesday 8 December. December in Reykjavík holds a very special time in the hearts of the people of the city. It is loaded with many traditional happenings which our guests can participate in. Here is a list of things to do this weekends and on going until Christmas most of it. The Christmas Creatures of Reykjavík is a special project created for the City of Reykjavík. The idea is to promote Icelandic folklore and connect locals and visitors in Reykjavík through stories and conversations. The phone company NOVA has joined forces with SAMSUNG and REYKJAVÍK to open an ice-skating rink on Ingólfstorg Square on 1 December, which also marks the 8th birthday of the phone company. The official opening will be at 20:00 and the ice-skating rink will be open from 1 December until 23 December. We proudly present the schedule for the first weekend of the Advent in Reykjavik. The term ‘Book-Flood-Before-Christmas’, which may sound strange and even horrific in English, is familiar to every Icelander (as ‘jólabókaflóð in Icelandic’). This can be said to be one of the main reading promotions in Iceland, not in the traditional organized way, but one that has grown out of tradition. Iceland Airwaves 2015 is around the corner! Biggest music festival of the year, Iceland Airwaves, starts next Wednesday. Want to learn the history of Videy Island? Stefán Pálsson historian will take guests on an entertaining history walk around Viðey island Tuesday June 9th. Viðey is full of history and Stefán knows stories about the munks who used to live on the island, the Sheriff Skúli Magnússon, seawrecks og bloody fights of the Reformation. The Stockfish Film Festival will promote European productions, industry networking, filming locations and tax rebates available in Iceland. The long winter days of darkness are set to be illuminated at the next Reykjavík Winter Lights Festival, which will be hosted in the city from 5 -8 February, 2015. The City of Reykjavík and the University of Iceland signed a partnership agreement on Wednesday, 7 January, to prepare the foundation of a centre for peace. The Centre is scheduled to open in the autumn of 2015 and will be located within the University of Iceland Institute of International Affairs. "December in Reykjavík" has kicked off with an agenda full of festive activities for the coming weeks. Apart from an emphasis on extravagant festive illuminations, the December in Reykjavík festivities focus on themes of peace, harmony and true Icelandic traditions. Christmas lighting and decorations will bring the Christmas spirit to our city in an old fashioned style with Christmas lights, bells and numerous Christmas trees. The exhibition Selection from the Ásmundur Sveinsson Collection will be opened on Saturday 10 May at 4 p.m. The exhibition contains works that span the whole career of the artist and clearly show how his artistic vision developed throughout his life. CHILDREN'S CULTURE FESTIVAL OPENS TODAY! Hundreds of kids from schools around Reykjavík attended a special event today at the Harpa Concert Hall to celebrate the start of the city’s fourth Children's Culture Festival. ARE YOU GAME FOR A NEW NAME? On June 1st a new museum will open its doors in Reykjavík! IMAGINE PEACE TOWER LIT FOR SPRING EQUINOX! Shop of the Year (Njarðarskjöldurinn) and the award for the Most Innovative Shop of the Year (Freyjusómi) were presented yesterday evening at a ceremony at the Harpa concert hall and conference centre to Gilbert Úrsmíður: The Master Watchmaker and Ófeigur Jewellery Store & Gallery. The City of Reykjavík will light up the IMAGINE PEACE TOWER on Ms. Yoko Ono’s birthday on 18 February. THE WINTER LIGHTS FESTIVAL PRESENTS POOL NIGHT! THE REYKJAVÍK WINTER LIGHTS FESTIVAL 2014 OPENS TONIGHT! Reykjavík Museum of Photography in Guardian Top Ten! Reykjavík qualifies as one of the 28 official finalist candidates in the New7Wonders Cities Campaign! CNN selects Reykjavík City as one of the most Christmassy destinations on the planet! There's a new Christmas Creature in town! Our remarkable winter wonders draw attention in Berlin! Landmark event celebrated at the Reykjavík Art Museum! Guided Tours in English through the exhibitions at Hafnarhús, Saturday 2 November and Sunday 3 November, 2013 at 1 p.m.
Get ready for Iceland Airwaves 2013 – the biggest yet! City to switch-off the lights in four districts! 2,000 people celebrate John Lennon's birthday on Viðey Island! Exhibitions by Alexander Rodchenko and the Kjarval Complete 2 opening 5 Oct.
RIFF - Ever watched a movie in a cave? LÓKAL – International Theatre Festival 2013! Culture Night opens with the unveiling of a sculpture by Rafael Barrios! Every summer we celebrate Gay Pride in Reykjavík and dedicate the festival to the LGBT people in Iceland, to their battles, pioneering spirit and joyous achievements! Reykjavík Culture Night will be held for the eighteenth time this year on 24th August. Amazing 360° Icelandic movie experience at the Old Harbour! The Iceland Expo Pavillion, designed for the World’s Fair in Shanghai 2010 and set up at the Frankfurt Book Fair in 2011, has been installed at the Old Harbour in Reykjavík.